Bryan Gilmer of Durham, N.C., teaches newswriting at the University of North Carolina at Chapel Hill and writes for institutional and corporate clients. Until 2003, he was a reporter at Florida’s largest newspaper, the St. Petersburg Times. He has just independently published a crime thriller novel, Felonious Jazz. 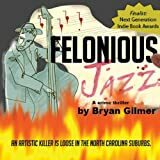 Last week, I created a Kindle version of my indie crime thriller novel, Felonious Jazz, using the tools at Amazon’s Digital Text Platform. It took about nine minutes, a “why-not” side project alongside my trade paperback, which I published using Amazon’s print-on-demand company, CreateSpace. As of 5 p.m. Friday – about 36 hours later – Felonious Jazz was the No. 1 selling hard-boiled mystery on the Amazon Kindle Store and the 17th best-selling title in Mysteries & Thrillers – the only title not by huge names like John Sandford, Michael Connelly, and Elmore Leonard in the top 25. Its overall Kindle sales rank was as high as 133rd out of all the 283,000+ fiction and non-fiction titles available in the Kindle Store. I thought, now that I’m in the rankings, I shouldn’t have to be so cheap. I bumped the price to $4.99. Sales continued, but at a slower pace, (and Felonious Jazz has slipped in the rankings. I probably should have stuck with $1.99 longer). I also drew in some people who just buy cheap Kindle offerings who don’t normally read the genre, though they may have been less likely to enjoy it than fans of similar books. But overall, what a no-budget way to gain visibility. A few big lessons here: Readers expect Kindle books to be much cheaper than dead-tree books (because they know it costs less to publish them and they can’t share them and worry they won’t have them forever). A cheap price is enough to buy your way up the rankings among national names with a zero-dollar PR campaign. Now that there’s a free Kindle app for iPhone, the potential audience for a Kindle title is not just the half million people who spent $359 for the device but many times that large. It’s surprisingly comfortable to read book text on the Kindle iPhone app. If you haven’t tried it yet, get the app and grab my free sample from Amazon, and you’ll see what I mean. It’s transformative to have a book you’re reading (or several) on your phone to pull out whenever you have to wait in line or for an appointment. More worrying for conventional publishers is that Kindle board posters don’t think big publishers are pricing their titles cheaply enough, and when prices get above $9.99 they get angry about it. I’m not sure whether the high prices are due to higher costs, more parties to share the revenue with, or the fear of cannibalization of paper-copy sales. (But the advantages! Near-zero production costs. No warehousing. No shipping. No returns. New edition at any moment. Never out of print. And the Kindle makes people read and buy more titles.) Could big publishers go from being at a tremendous advantage to competing for top-25 sales rankings – if not profits – with a guy in his home office? Will a Netflix-like company launch without the expensive legacy infrastructure of the big New York houses and take advantage of elasticity of demand at much lower price points? As I type this I realize – maybe that’s Amazon. A bad side effect is that without barriers to entry, a lot of non-professional-quality content creates clutter. But to some degree, crowd sorting (via online reviews and such) can cope with that. Bryan Gilmer of Durham, N.C., teaches newswriting at the University of North Carolina at Chapel Hill and writes for institutional and corporate clients. Until 2003, he was a reporter at Florida's largest newspaper, the St. Petersburg Times. He has just independently published a crime thriller novel, Felonious Jazz. Can i ask you exactly how many copies the 17th best-selling title in Mysteries & Thrillers actually sells on Kindle? The low hundreds per day. It would be helpful to everyone for you to reveal the firm stats. This is of interest to everyone out there who writes professionally. And "low hundreds per day" still sounds better than the daily sales of many other print books. However, with the confiscatory/upside-down money split, it's not very appealing. Well, I'm not going to get any more specific on my sales numbers. I will say that as an independent, the Kindle DTP deal of 35% of list price seems okay by me. To get a selling price of $1.99, I set a list price of $2.49 and earned 87 cents a copy. At 6.24 list, I get my current selling price of $4.99 and earn about $1.75. More than I'd earn per copy on a print contract. If I was selling a Kindle book for $9.99, I'd earn $4.37. As both the author and publisher, I don't have to share with anyone. Well, I'm not sure that the price is what's important, that the price will determine whether I purchase your book. I think my TIME is more important. I don't have the TIME to read a $1.99 or a $4.99 unknown Amazon-generated mystery when I already don't have the time to read some of my favorite authors. I realize that "time" is somewhat self-determined, but I know I will be more likely to spend $14.57 for Road Dogs for my Kindle and feel like my time was well spent. Yes, I take the risk of missing your potentially even better book, but I am pretty much willing to let the critics spend their time on your book first. As a bookseller I am anxious for new, bright talent and am willing to invest in it, but my investment won't be based simply on the cost. I am, however, impressed at what you've done, that you came up with the idea. I'm also impressed that it is possible to DO what you've done, apparently so easily. Don, I'm sure it helped my effort that my other job is freelance PR. I blocked out a little strategy, (though a simple and free one) and it worked very nicely. And I would love to believe that the title, cover art, blurb and free Kindle sample sealed the deal for more readers than the price. The truth is, I just don't know. Maybe the price's main function was to get it into consideration, and if people likes what they sampled, they were happy to go for it. I'll say that I'm in the same situation as you: Stacks of books, many written by friends of mine, that I just haven't had the time to read yet. So I was surprised to learn how many of the people who spend $359 on an electronic reader are super frugal when it comes time to buy the fiction to read on it. What portion of Kindle owners that is, I can't say. But they are quite vocal on Kindle discussion boards. You're sure right about the frugal (stingy?) issue! And I can't figure out the thinking behind that. I'm still learning how to best use my Kindle (the wireless part doesn't even work here; no Sprint), but I like it a lot more than I thought I would. It won't replace my books, or future books, but I will use it. For a long time, I was quite worried about where all this (e-books, etc. )might lead (and still am, to some degree, as a bookseller), but now I'm kinda excited about being on the journey. Very interesting. Don makes an excellent point about time. I recently issued my YA novel Mortal Ghost at Amazon for the lowest possible price ($0.99) only to make it simple for Kindle owners in the U.S. to access it, since it's already freely available in multiple e-formats online, including Kindle-compatible ones. Frankly, I couldn't care less how many people buy my books, since that's not how I judge my work, but I've learned how very difficult it is to be taken seriously as an online writer – even by most lit bloggers, who hardly ever bother to review net fiction. Their claim – with of course some justification: who has the time to read through all the crap in order to find something worthwhile? I'm very curious what your PR involved for this. Being unpublished and considering alternative avenues, I am always looking to learn what might make venues like this workable. I can attest to the power of Bryan's model. I priced two of my books (The Ark and The Palmyra Impact) at $1.99 and the other (The Adamas Blueprint) at $0.99. In the two months they've been available for the Kindle, I've sold over 4,300 copies total, and The Ark is currently ranked at #160 (#14 in the Thriller section). I have not raised my prices because I think that it's a great way for people who would otherwise be wary of indie authors like me to take a chance on reading my books. Quite an interesting and informative article. If you wouldn't mind, I'd love some links to the said Kindle discussion boards. Any idea on how long those types of sales figures will run? Low hundreds per day * $2.18 per sale * 365 days adds up to quite a bit of change. Just curious if you think it's sustainable. Kindleboards.com is a great resource for those interested in the Kindle. Sales figures drop off dramatically as the rankings fall. I'd say sales are around 10-20 copies per day at an overall ranking of 1000. Of course, that will change as more people become Kindle users. It's hard for anyone except name authors to stay in the top 500 rankings with books priced at $4.99 or above because readers want to know that they'll get value for the money they spend. First of all, what a great blog post! This is why the Millions is the best literary blog on the web. I commend Bryan for trying something bold and for being savvy about how he did it (and as no one has yet pointed it out yet, said savviness continues with this well-timed blog post). I've said for a while now that self-published authors need to find a way to promote themselves, as clearly the barriers to publication have never been lower. It's the barrier between an author and his/her readership that remains quite high (possibly higher than ever). I think this is what Don and Lee are getting at with their comments. Even though you can put your material out there, getting people to read it remains the big obstacle. So again, kudos to Bryan for at least getting his book into people's readers. That's a big first step. I am a bit worried about the implications of this, though. I'm not sure how I feel about turning the bookstore of the future into the .99 cent store. As the cost of content continues to approach zero, we are going to see some fallout. What if the author of the book is a lousy graphic designer? How would he afford to pay a designer to make a cool jacket (or thumbnail, as the case may be)? With what part of their $.70 a copy? What about hiring a publicist (admittedly not a problem for Bryan)? This is a model that seems sustainable for self-published authors only. Not all self-published authors will be able to handle the rigors of self-promotion. I'd wager it's every bit as hard as writing a book. I deal with authors every day, and most of them are not good at selling themselves. That will have to change, but I think book publicists and marketing people actually do earn their money. If you think all a publishing company does is print the books, you are wrong. Do publishers need to change certain aspects of their business model? Definitely. But they still serve a valuable role. Is self-publishing and self-distributing a great thing for some authors? Undeniably. But I don't think it can serve all authors. It would be a shame to miss out on those authors' books because they couldn't afford to hire a publicist from their meager pay. Like it or not, higher ebook prices will come, and they will benefit everybody, authors included. Bryan found a way to game the system, and it's one that worked for him, but I'm not sure it will work for all. I don't have a problem buying from an unknown author, providing they have good reviews on Amazon. So the low initial price is to get enough readers to have at least several reviews. A price of 0.00 gets even more downloads, but probably not many more readers. Raising the price later seems reasonable to me. Perhaps ebooks will be offered at discounts to start and a price increase after a week or two. Retail stores do this all the time. Maybe time for booksellers to do things differently. I came here from Twitter. I find this story very revealing. I own a Kindle, and I have bought books for $1 that I would not have bought had they been $5. One advantage of the Kindle store is that you can almost always request a free sample of a book before buying it. I always do that with new authors, except when the book is so cheap that I figure "why not"? And to answer one commenter, one reason why we plunk down our $359 is so we don't have to pay $25 and up to read new releases. If you read enough books, it actually makes economic sense over time. That's not the most important reason; the most important reason is it makes it easier to read more because I carry my Kindle all the time. As a writer, I would also point out that I would much rather get a 25 cent profit per book and sell 2,000 copies than get a $3 profit and only sell 100 copies. It's not just the money, it's the number of readers. Love the title of this book, BTW. Karen, this is very interesting to me. You would buy a $1.99 title rather than bothering to sample because it's so cheap. That generates the burst of immediate sales I saw. But not at $4.99 Where's the threshold? Would you buy immediately at $2.99? $3.99? I also appreciate the cultural insight that many Kindle owners are extremely heavy readers and didn't splurge but made an investment they believed would lower their book spending. I caught a whiff of this on Kindle boards, as well, and I think it accounts for the rage at any title above $9.99. People felt they'd been given an assurance that Kindle books would cost $9.99 or less, offering savings over hardcovers and most trade paper that would pay back the cost of the device over time. Probably a decision-maker for many buyers. So they don't like to see a bestseller Kindle title break that pact with them. This is a great discussion. Let's keep it going. Great post – this is exactly what I suggested we might see AGAIN when content becomes available at a lower price point (remember paperbacks in the '50's?). This is how the author can build a following, enlist fans to become advocates and give them the tools to spread their enthusiasm. Authors own the relationship with the reader – and those who take charge of that are the most successful. Bravo! I published on Kindle a while ago. The publishing portion works well and you do get posted. I did adjust my price and got a small sales pop from it. The one thing that Amazon doesn't help you with is advertising (like google adwords). You don't really have a choice where (and if) your book pops up as a suggestion and they do not give you any stats on how many times hits/views you have gotten et cetera. But all in all it is the way things are going….I'm really looking forward to the DX this summer. It's not that difficult to figure out why publishers have higher costs to recoup: Advances, editors, production editors, promotional costs, overhead. Need I say more? As a self publisher, you took advantage of a great opportunity. Congrats on your good sales! That said, it isn't that difficult to figure out why conventional publishers are charging more: Advances, royalties, editorial costs, promotion, and so on. Printing, warehousing, and fulfillment are not the only costs a publisher faces. This post pushes the discussion to another level. My sense is that some reasonable blend of legacy and self publishing will emerge. In fact, I was wondering if you, Boyd, are open to the possibility of being picked up by a publisher, as was (I think) The Shack. Will this be a different process — or an impossibility — for those who go straight to Kindle as opposed to hard copy books? Yes, I would certainly be interested in working with a publisher. Publishing print books myself is a hassle that I don't want to take on, while publishing on the Kindle is very easy because my books were already in electronic form. All I had to do was pay someone to design nice covers for me. I think anyone who gets enough sales on their own, like the author of The Shack, will eventually attract the attention of mainstream publishers. It just hasn't happened yet for someone who only published electronically. But it will. My novels are published by big NY houses, under the names JA Konrath and Jack Kilborn. But before I landed my first publishing contract, my agent struck out with several other books. For years I've made these unpublished books available as free downloads on my website, http://www.jakonrath.com. They've been downloaded over 20,000 times. On April 8, I uploaded these titles to the Kindle, selling them for $1.59 each. In six weeks I've sold almost 2000 ebooks. Also, I've been working with my publisher to get a horror novella I wrote with Blake Crouch, titled SERIAL, on Kindle for free. It's currently the #1 download. The perception of value that has been leading people to consider Kindle books priced at the same level as printed books seems to me to be both a judgement of the relative production cost (the up-front costs associated with writing, editing, and formatting are essentially the same, but the incremental cost of a single copy is virtually nil for an e-book, as you describe, compared to printing, shipping, and storage costs for printed editions, so more of the purchase price can go back to the author even at a lower price) and of the end utility. While the storage requirement if I buy ten paperback novels for me to read than if I buy ten e-book novels for me to read, when I buy an e-book the emphasis is on the pronoun. If I buy ten paperback novels, I and nine of my friends can read all the novels at once, passing them around in a round-robin as we finish them (and give them away or sell them to a second-hand bookstore when I am tired of reading them), buying ten e-books acquires them for _me_ to read — no one else can read them without having the reader in their possession, which deprives me of its use for the other books stored on the reader, and I am unable to pass the copy onto anyone else. An e-book is therefore of much lesser utility as part of a library of books than printed editions of those books are, so being expected to pay the same (or, in some cases, higher) price for the e-book is perceived as price gouging. Unfortunately, the same aspect of e-books that lower their incremental production cost (a copy of an electronic document is fast and cheap) also effectively destroys the characteristic of a printed book (tedious and expensive to copy) that has made them reasonably secure against unauthorized copying for centuries, which is a problem that still has no good solution. I am wondering if anyone has thoughts about self-publishing in genre fiction versus self-publishing in literary fiction. Most of the self-publishing discussions I've seen originate from genre writers and readers. I wonder if genre readers have different book-browsing habits? Different book-buying habits? For example, did Bryan target genre readers on Amazon (does Amazon have these targeting functions?)? Do genre readers tend to read MORE books in a shorter amount of time (they do call them page-turners, after all) and thus download lots of free and $1.99 books at once? It seems to me that genre writers have a headstart on self-publishing skills/strategies, but that literary writers will need to follow suit soon enough. The literary mid-list seems to be shrinking alarmingly fast: no more building up of a writer over time; if it doesn't make the publisher money NOW, then they're unlikely to publish any more of your books. Bryan– the break point is somewhere between $1 and $2. I almost always get the Orbit books that are $1 (they offer one title a month that way) unless I can tell it's just not a genre I would read. Another thing is, it has to be a book available through the Kindle store so I can use the wireless and not have to download first (I am very lazy). The exception is Fictionwise, where they added a "Send to your Kindle" function. Above $2 I don't buy it without getting a free sample first. Good luck with this project. Publishing is changing. It's exciting! Bryan, thanks for the great post. I'm a fellow journalist and writer. My previous books have come out with traditional publishers, so when I decided to create a Kindle edition for my latest novel, Finding Juliet, I was hungry for advice from others who've tried it and found success. Your pricing information has been priceless, and helped me get off to a good start. Also, posting a couple free chapters in the discussion section of my product page should help. Wishing you continued success and am interested in reading more about your Kindle success strategies. I have only used kindle on the iPhone. I am an avid reader and do not consider a dollar or two less than print acceptable. With one exception, if I am stuck in an airport with no bookstore I will consider it. Incidentally, this was the entire reason I got the kindle app in the first place….. Excellent post. I had results similar to those described by Bryan after posting my first book to Kindle and lowering the price to 99 cents (Unbroken Hearts). Just 3 days ago I uploaded the sequel (Untamed Hearts), available at a somewhat higher price. This is the best way for a new author to gain exposure. Thank you for starting this informative thread, and thanks to all the posters for expanding on it. I have always had dreams of becoming published author, but the process of becoming published is a little intimidating. The uprising in e-books seems to be the perfect answer for people like me. I am a professional in a field completely unrelated to writing, so the money doesn’t really concern me, but it would be nice feel that if I pour my time and energy into producing work, that there is a reasonable chance that someone may actually get to read it. it is amazing to me think that these stories and ideas that I have been nursing in my mind for so many years may actually find someone. The only hurdle left to leap is my own laziness! My only conern now is that I will be, as Mr. Konrath puts it, “self-pubbed crap,” but I guess that wouldn’t be the end of the world. On Monday morning (tomorrow) I am going to decide whether or not to contract for services from a self-publishing firm for my “Sophie and Sam Mystery” series. I’ve chosen the one, but having just reread this thoughtful conversation am left wondering if I need those services — or perhaps some others not in packages. I have spent 40 years making a living as a marketing writer. I think I’ve passed the test on readability, etc., and of course got encouragement for my storytelling from the assigned reader from the press I am considering (cost only $35). None of the participants in this discussion have discussed hiring a designer. I want a good cover. I can get an illustrator to do that. One person wrote about the ongoing promotional challenge and that’s where I think there’s a lack of continuing help from most self-publishing organizations. Yes, I can get on Facebook and promote myself but where, for example, does a self-publisher get help to find a reviewer? I just opened my Kindle two days ago and am halfway through a Donna Leon — love the Kindle, and am convinced other people my age will, too, once they try it. I’m targeting the over-65s. This post is very informative and has renewed my enthusiasm for trying the e-publishing route, despite disappointing financial returns from the musical equivalent, which I have been involved with since its inception. I fear literary publishing may go the same way as music, i.e. simply a surfeit of content (good and bad). However, as a European I am frustrated by Amazon’s insistence on a US bank account. This appears to bar me from the Kindle-based system, and hence from the iPhone audience. Has anyone found a way round this, e.g. does a Paypal account qualify? I’m an unpublished author of a short novel for young teenagers. I’m also a very busy person, and finding the time to pursue conventional publishers is an intimidating prospect. I understand that for a new author, finding a publisher is a matter of weeding through many rejections to find a publisher who is interested. I accept that fact… but I simply don’t have time right now to go out there and start getting rejected. Also, does anyone have any insight into the size distribution of the Kindle market for different age groups? Finding this site and reading all the comments has inspired me to publish my novel (Bad Girl No More) on Kindle. I have been writing for years, but had no luck in finding an agent or a publisher. Since time marches on, I decided to stop banging my head against the wall and do this. I love the whole idea and am waiting to see what happens. Even if I don’t make much money, I love the idea of my writing being “out there”…visible to whoever chooses to read it. Thanks so much and good luck to us all! But I’m not sure that reviews will really tip readers off to the very bad. What I’d like to see Amazon do is change the Kindle review ratings from stars to stars with equivalents in dollars. For example, five stars might mean a reader recommends that this title is a good read for five dollars. 4 stars recommends a price of 4 dollars, and so on. Of course, that does assume that the best fiction for self-published kindle books would have a maximum price point of five dollars. I think it’s a good compromise, since this is still half of the $10 max price that Amazon has instituted against the publishing houses. Also, I’m a little dismayed with 35%. True, it’s more than the 10% in many normal contracts, but think of the money this generates for Amazon. And for doing what? Setting all of this in motion? Thankfully the Kindle won’t be the monopoly in digital self-publishing for long. If ever there was a wonderful argument for the Iphone. I hope everyone who can afford to buys one, and then another savvy business man decides to cut authors a 50-50 split. Following your advice and moving my price down from $4 to $1.99. We’ll see how it goes. I’m from Raleigh NC orginally and went to UNC for a semester. I’m a huge Heels fan! Ended up transferring to Belmont University in Nashville, however as they are one of the few schools with a Music Business major. I’ll put your book on my “to read” list. Does self-publishing on Kindle stigmatize or blackball you with traditional print publishers? If you publish on Kindle, will the traditional publishing houses then not touch your work? Thank you so much for such an in-depth article. I must say as a Kindle reader (and soon to be owner of the Kindle 3), I haven’t even received my first Kindle yet, but thanks to the Kindle for Android app, I have already been a busy little bee reading several novels. Some are from the big publishing companies, books that I just could not do without. I even purchased some books for the Kindle that I already have in paperback or hardback. I just wanted to be able to read them anywhere, because I love them dearly. But I have also bought several novels from folks on there that are doing what I am about to venture into… self publishing. To answer the price issue… yes, I do feel I have spent some mega bucks on this little electronic device, and with that being said, I shouldn’t have to pay more than a paperback’s price for a popular novel. Unfortunately thanks to Steve Jobs, the prices went up after his little holdout, and so they now price books like Twilight, The Girl With the Dragon Tattoo, and all other bestsellers between paperback price and hardcover. Seeing as we don’t receive a hard copy of this book, why should we have to pay like we are? To answer the issue of unknown authors… I’ve run across some really wonderful authors in the under $1.99 category. I’ve also read some really horrible novels in that too, and that was a fairly popular novel that was just absolute garbage. If you want, you can read my critiques of novels that I’ve read thus far, on my kindle blog that I put in the website link. The best way to find out about a novel is to do two things. Kindle allows you to preview the book, do that. Trust me, I didn’t do that on two books and I completely regretted it. The second, read the comments. You have to learn to pilfer through some of the inane comments, and some of the ones that are just five starring for the heck of it. I suggest click on the one and two starred comments first. I look forward to reading my Kindle for years to come, and yes, I look for the inexpensive novels first, because the way I figure it, at least they know what it’s like to be poor. Unfortunately, HarperCollins just doesn’t get that, and that’s why I’ve for the most part just added their books to my wish list as I wait for the price to come down. I was wondering, if anyone knows, now that the 70% royalty has been around for several months, if there has been an exponential increase in the number of self-published novels, and therefore lower sales individual authors. The change from 35%, I would imagine, would have had a profound effect on the number of submissions. I dont own a kindle because of the dilemas that some of the comments above have faced me with. A kindle i can carry with me anywhere, its easier to hold while doing other things and it gives me access to almost any book i want almost instantly. My problem is i love books. So for authors i follow and read everything by it seems odd to me to by both (because i would) so for me a very cheap e book is a way for me to read the book anywhere while still having the actual book at home to keep and share etc. to by two of the same book.. for about the same prices just doesnt help me.. so i refuse to buy a kindle and i miss out on new and upcoming authors. Excellent post. I’d love a little more detail or information on the kind of PR strategy you outlined. The price point information is useful, but to a non PR person, I’m afraid I have no idea how to create interest. The traditional publishers have had it their own way long enough. All aspects of media eventually have to fend off healthy competition. Now, the writers have a little power in their hands – and some control over their work. Ebooks may open the sluiceway for some trashy writing, but I feel many gems are about to be discovered that would likely languish in some huge slush pile for all eternity. I was a doubter like many, but ebooks are here to stay. Just an add on after reading some of the posts. I understand authors feeling fearful of being ‘marked’ by traditional publishers if they have gone down the ebook route. Believe me, if you have attained thousands of downloads over a period of time – I tend to think they might sit up and listen . . . I actually had the opposite experience of many who’ve commented. I put my mystery novel, DEAD IN THE WATER, on Kindle for 99 cents and sold 0 copies. Then I raised the price to 2.99 and it started selling. Granted it hasn’t been up that long and it’s not selling in huge numbers – but the numbers are growing every week. I think that it’s fair to say that the Paretto principle will sort out the majority of writers who decide to self-publish digitally. It’s great to hear a success story and here we get two for the price of one – Brian and Joe. It clears up a few things for me especially when it comes to pricing. I expect to self publish myself within the next six months, first digitally and then perhaps a year or so later using POD. I have set out a model for myself where I can produce between four and six short digital novellas yearly which will form a series. Upon completion of the series I intend to publish each of the digital editions in one paperback novel perhaps with some extended chapters/features. It is nice to hear that other writers are already working on similar models and using pricing structures that effectively attracts the attention of readers. (Always the most important thing) At least now I have a better idea of what pricing structure I should use. Anyway Brian, well done and keep up the good work.